Out of the three squares a day, breakfast — especially weekday breakfast — gets the shaft. We often neglect it, abandon it, or grab the nearest bar/baked good/fill in the blank with whatever packaged food is within reach. We get it; we do it, too. Advanced meal prep can help solve the “what-healthy-thing-to-eat” dilemma at all times of the day, but it can be particularly useful for the first meal of the day, which is often a last-minute scramble. If you take some time to plan on the weekend, you can have more healthful and generally lower calorie versions of the fallback foods you love for breakfast available just as conveniently as those store-bought or drive-thru foods. 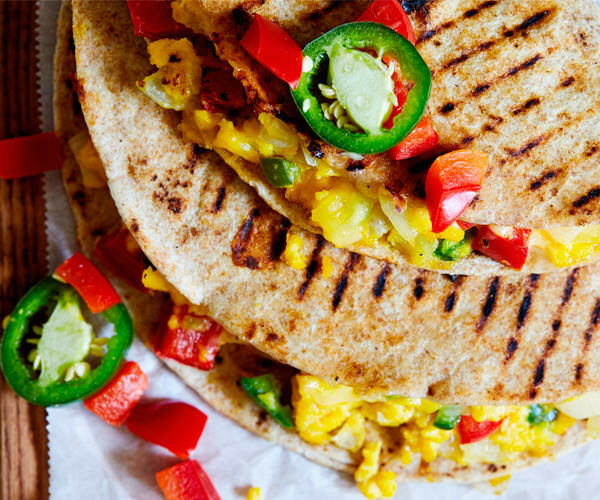 For those mornings when you worked out so hard you can almost feel yourself wasting away, or you had one too many the night before and the drive-thru seems like the only way to make peace with your angry stomach and throbbing head, or fluffy eggs and oozing cheese are the sunshine you need to tumble out of bed, these breakfast quesadillas are about to become your new BFF. These crisp, warm, melty pockets of fast-breaking joy can be macgyvered to suit any palate, and can be made in advance and reheated for busy weekdays. 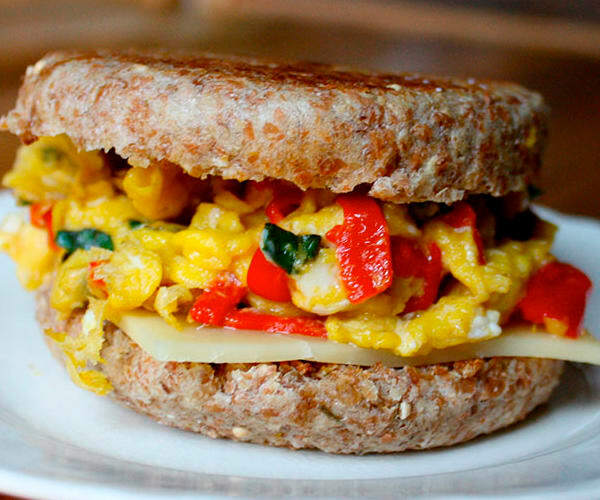 If you want more handheld scrambled egg goodness, our veggie-spiked take on that popular drive-thru breakfast classic involving English muffins gets a meat-free makeover. We trim the saturated fat by using part-skim mozzarella and one whole egg plus two egg whites. We amp up the flavor with roasted red bell peppers and fresh basil for a Mediterranean spin on the egg sandwich, but feel free to add whatever floats your boat. Three words for you: Bread, eggs, cheese. Make that melted cheese. Who doesn’t want that for breakfast? Strata, a casserole made usually with day-old bread and a cheese-spiked milk-and-egg mixture, can not only be a life-saver brunch idea (Have you ever invited friends or family over for brunch only to be trapped in the kitchen, flipping omelets?) but also a life-saver make-ahead meal idea. 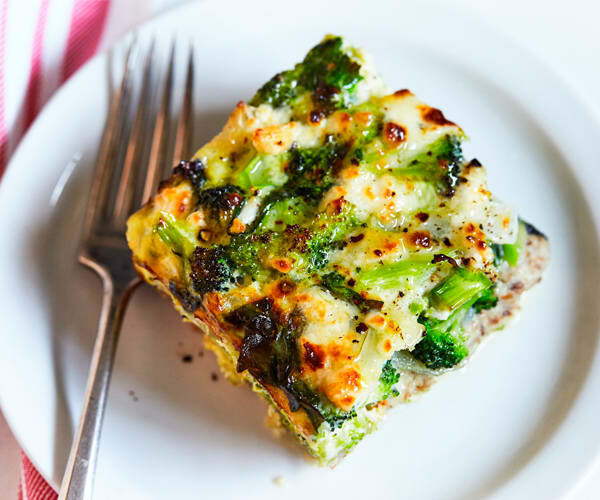 Bake off a dish of this Spinach and Broccoli Strata and you can have breakfast for the entire work week (plus extras!). Some of you might be thinking: “Enough of the savory already. Where’s the sweet?” We hear you. And these Chocolate Peppermint Muffins are gonna rock your world. 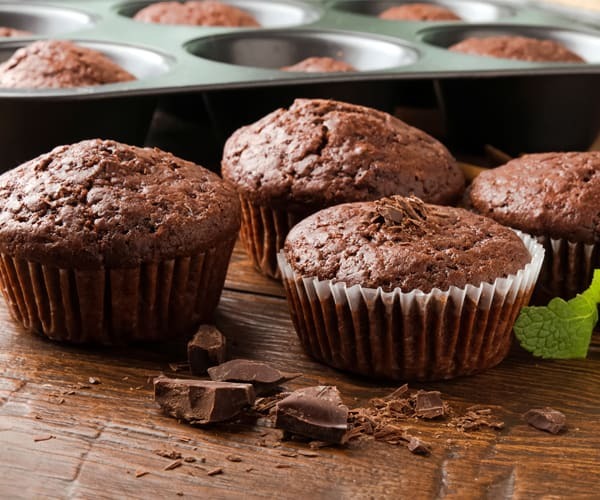 Sweet, refreshing mint and rich cocoa flavor aside, these moist and crumbly handhelds contain just 133 calories per muffin. You read that right. This means you can have two for breakfast and still be under 300 calories total. For those with an aversion to gluten, there isn’t even a pinch of flour in these; we use chickpeas for structure. Chocolate not your thing? 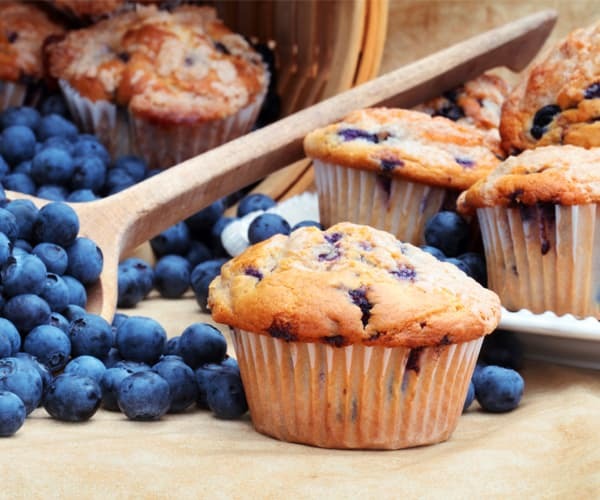 It’s hard for anyone to resist a warm blueberry muffin — that tender, yielding crumb, that tart and sweet burst of berry, that whisper of vanilla and sugar that lingers. But, as muffins (and, well, all food portions) get bigger and bigger, all of those comforting refined carb calories can stack up quickly. Our remake keeps everything we all love: fresh blueberries, sweetness (from maple syrup), and richness (from coconut oil), and combines it with healthier ingredients, such as whole-wheat flour, wheat germ, and low-fat buttermilk. This ain’t your grandma’s banana bread. Props to granny — her bread is perfectly delicious, moist, and comfortingly sweet, but… all those refined carbs and not much protein or fiber to help redeem it. Our more modern take on this old-fashioned staple makes it safe for gluten-intolerant and gluten-sensitive folks, and is great for those watching their cholesterol. This doesn’t mean it’s not tasty. We’re not the types to offer you a banana-flavored piece of rubber (Have you ever tried an oil-free quick bread? Doesn’t it remind you of rubber?). 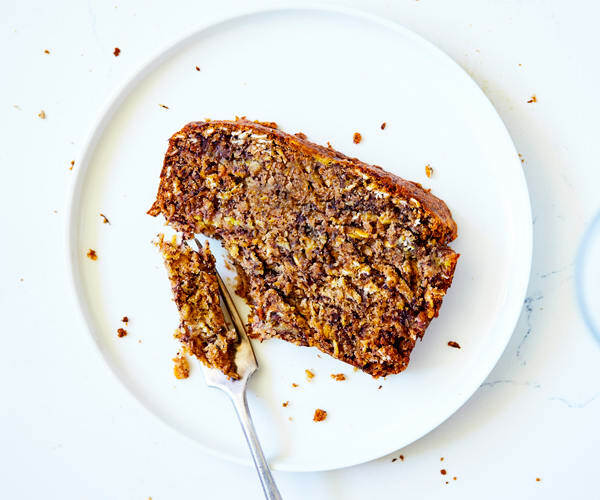 Our banana bread recipe walks the line between rich (we swapped butter for coconut oil) and healthy (5 grams of fiber and 6 grams of protein per serving), and it hits all of the flavor notes — banana, vanilla, warm cinnamon spice — you expect. Can’t stomach much early in the morning except for that mandatory coffee? We have just the thing for you. 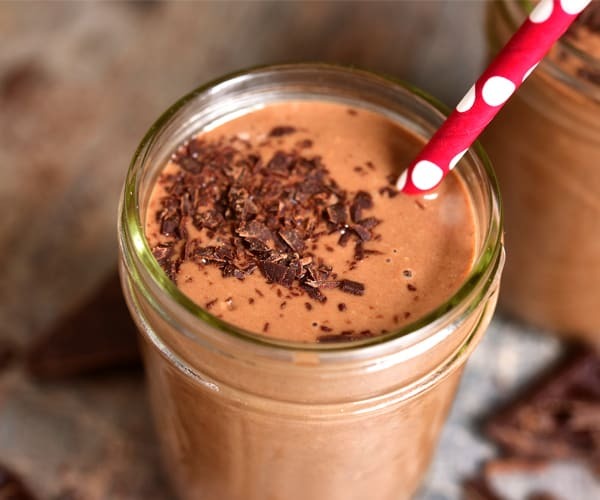 This Mocha Caramel Latte Shakeology recipe has all of the sweet caramel and chocolate flavor of a frosty dessert beverage. But, instead of being loaded with sugar syrup and cream, it’s a healthy snack that won’t bust your diet. The secret that makes this recipe taste as good as the original: the caramel extract. Real caramel is made by melting butter, cream, and sugar… three ingredients that anyone with fitness and nutrition goals should generally avoid. But caramel extract provides the same buttery, burnt-sugar flavor without any of the guilt. It’s a game changer for your sweet tooth. If you love cereal and have since you were a kid, there’s no reason to give it up. Just try making your own at home so you can control the quality of the ingredients. While our version takes some time to bake, the ingredients are easy to assemble. You’ll need to babysit the oats while they toast in the oven (stirring every 15 minutes so they don’t burn), but this is the perfect recipe to make while you’re meal prepping for the week, doing chores around the house, or helping the kids with their homework. 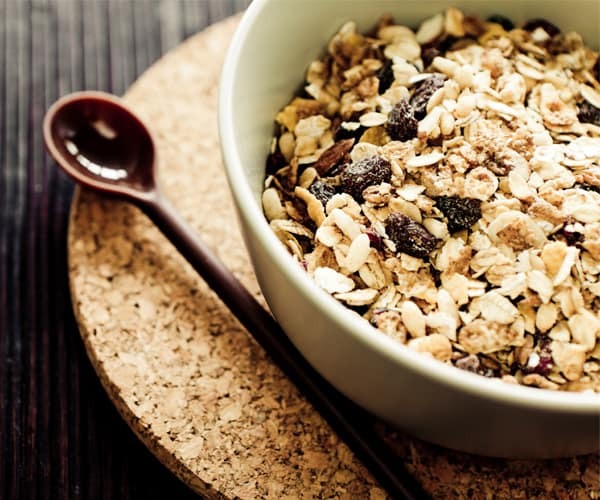 This one’s for those who love granola, but don’t have the extra time to sit and enjoy a bowl of cereal in the morning. 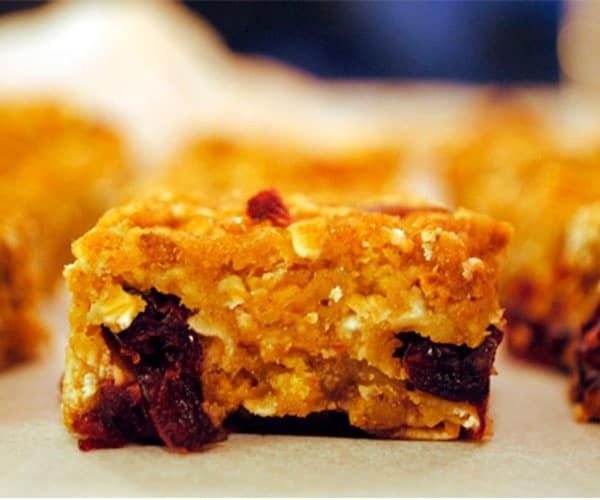 Much healthier than processed, packaged granola bars and nowhere near as indulgent as those half-shortbread, half-oat, jam-packed sugar bombs sold at coffee shops, our Cranberry Granola Bars pack a tart, savory punch all for 87 calories. Yes! Eighty-seven calories.